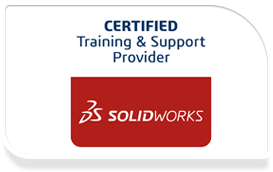 SOLIDWORKS Simulation Xpress is a first-pass analysis tool that comes with every SOLIDWORKS Standard and Professional software packages, giving you the ability to do basic stress analysis on individual parts. You can quickly determine effects of force and pressure, and generate reports to document results. When you are ready to test full assemblies, it is easy to upgrade to advanced SOLIDWORKS Simulation packages. Simulation Xpress uses the same simulation technology that SOLIDWORKS Simulation uses to perform stress analysis. More advanced simulation capabilities are available within the SOLIDWORKS Simulation line of products. The wizard interface of Simulation Xpress uses elements of the full Simulation interface to guide you through a step-by-step process to specify fixtures, loads, material, run the simulation, and view the results.